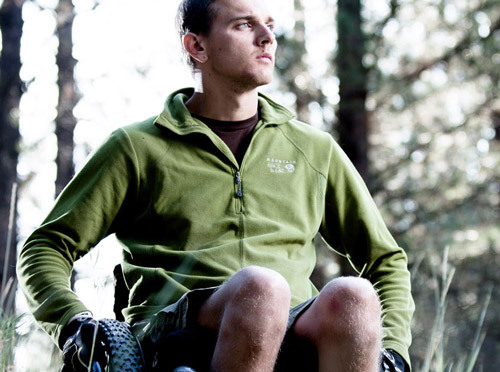 On August 13, 2010, Joe Stone nearly died after crashing into a mountain at almost 50 MPH near Missoula, MT, while speed flying, a form paragliding. 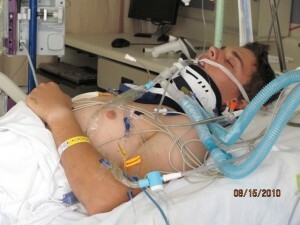 The accident left him with a permanent spinal cord injury at the C7 level, rendering him an incomplete quadriplegic, meaning he is paralyzed from the chest down and has impairment in both his hands. I was an athlete and avid outdoors man before this injury and at first I felt lost as if I would never be able to do many of those things again. However, through research and determination, I learned that there are many ways to get back into the outdoors even with a physical limitation. I decided to set a large personal goal as a way to find out for myself, what was truly possible with my level of injury. On August 12, 2011, one day before the one year anniversary of my accident, I successfully hand cycled the challenging Going-to-the-Sun road in Glacier National Park. When I achieved my goal of finishing that ride, I discovered that my life truly felt limitless again. I set my sights on completing IRONMAN Florida on Nov 2, and becoming the first known wheelchair-using quadriplegic to complete this grueling race. The Ironman Triathlon consists of a 2.4-mile swim, a 112-mile bicycle ride and a marathon 26.2-mile run, raced in that order and without a break. Top able-bodied competitors finish the race in about 9-10 hrs; I was hoping to complete it in between 14-15 hrs. The race has a hard time limit and has to be completed in a max of 17 hrs. On the day of the race I battled large swells in the ocean and cool temperatures increasing the risk of hypothermia as I swam for almost two and a half hours completing the 2.4 mile swim but missing the time cutoff by just minutes. While this was a very large personal goal, the bigger vision and purpose for doing this is to share the experience of this journey as a way to inspire others to push the boundaries of perceived limitations to live rich and fulfilling lives, regardless of their physical and mental abilities. To help further this mission, I speak to groups and organizations, volunteer as a peer mentor, and engage in outdoor activities with people of all abilities.